XSS Password Stealing – Who needs cookies?! Most people are already aware of using XSS to pop alerts or steal cookies. Today I'd like to show XSS password stealing. While stealing credentials with XSS is a bit more difficult, the pay off is even greater. You do not need to worry about cookies becoming invalid, and there's always the chance of reused credentials. The application I will be attacking is a slightly modified version of one of my demo pages. I borrowed the index.php file from a LASACTF challenge and edited for this attack. echo "<i>Your current language is $lang</i>"
Login.php is a simple CTF login that will display a flag upon success. While this is vulnerable to SQL injection, this is not the attack I'm going to demonstrate. While not necessary for this vulnerability, app/config.php contains the flag and the DB file's location. Other than that, you will need a SQLite database containing user information for the application to properly function. If you'd like to just follow along, I've included the one that I'm using below. If you did not notice earlier, the lang parameter is vulnerable to an XSS attack. After modifying the language parameter slightly, an alert pop-up appears. In this case, the attack will be against the browser's saved credentials. First, obtaining the username and password from the SQLite database for a proper login. With the proper credentials in hand, I logged into the application. When prompted, I had the browser remember this login. The next time I loaded up index.php, my credentials were already populated as expected. In this case, if our victim has credentials saved in their browser, then we can steal them with XSS. Once I had my payload in hand, I URL encoded it to make pasting it into the browser a bit simpler. 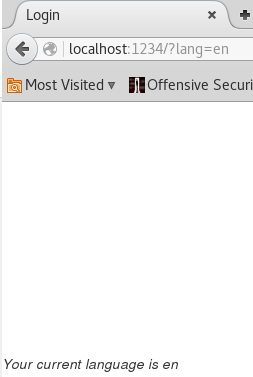 Upon loading the page with our new malicious lang parameter, the browser injected our new code. Additionally, the application sent the stored creds over the wire to our attacking machine! 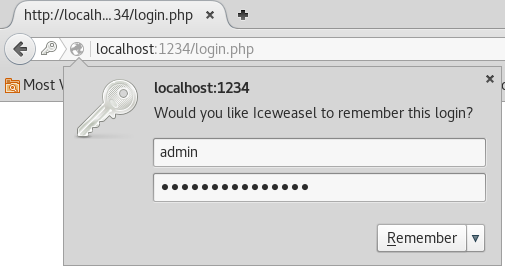 While this attack requires XSS on the login page AND saved user credentials, hopefully I demonstrated its severity. Note that, in some cases, you will want to add a delay to the stealCreds method. The reason for this is that the browser might not fully load somewhere, and the browser will not auto-populate the creds by the time everything loads. Other than that, remember you can shorten this payload using techniques similar to the Short XSS attack. 2 Responses to XSS Password Stealing – Who needs cookies?! How can we code such that we email the stolen credentials to a local host email address?